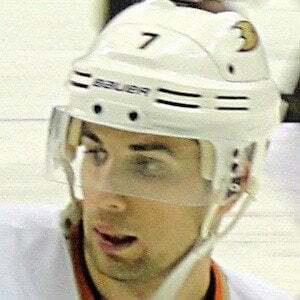 25th overall selection of the Edmonton Oilers in the 2005 NHL Draft who officially joined the team in the 2007-2008 season before being traded to the Anaheim Ducks in 2011. He set an NHL record by scoring three overtime goals in three consecutive games. His gloves and stuck were sent to the Hall of Fame. He spent time playing in the Ontario Minor Hockey Association and the Greater Toronto Hockey League before being drafted by the Toronto St. Michael's Majors of the Ontario Hockey League. After one more stop, he played collegiate hockey at the University of Michigan for two years. He became the 20th player in the history of the National Hockey League to play in 500 consecutive games, and only the 5th to achieve the feat from the beginning of his career. He grew up with a brother in Toronto, Ontario, Canada. He married Allie Bertram in 2017. They welcomed a daughter named Lottie in 2019. His first professional goal came against Red Wings goaltender Dominik Hašek.